Glass weights are needed to keep the ferment below the brine level, but they also can be used for displacement. If you make a small batch of something that does not fill up the jar, you can simply use extra fermentation weights to occupy the void left in the top of the jar. Since a small ferment will only off gas a small amount, this practice fills the extra space with glass, leaving only a small amount of oxygen remaining to be displaced by your ferment. 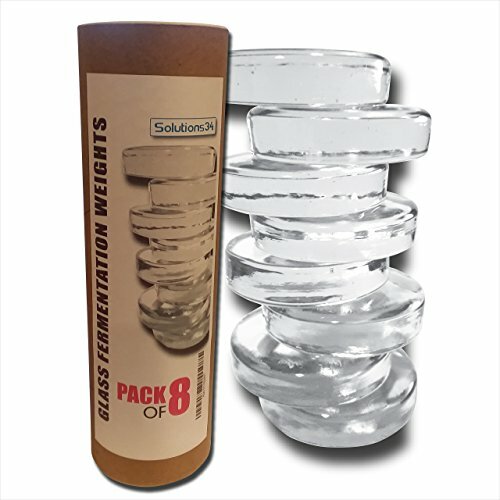 If you are not satisfied with the your 8 Pack of Fermentation Weights, just return them within 30 days for a full refund. No questions asked!!!! Buy your better and easier fermentation weights today.........Scroll up to click the Add to Cart button. SAFETY FIRST - Made From Lead-Free, Non-Porous, and Food Safe Glass - Made From Pure Soda-Lime Glass - This is the Same Glass Used to Make Ball and Kerr Mason Jars. BETTER FERMENTATION - These Weights Keep the Vegetables Below the Brine to Help Prevent Mold and Improve Taste. SUPERIOR DESIGN - 2 3/4 Inch is The Perfect Diameter, Keeping the Contents Under the Brine However Not Too Large so You Cannot Remove the Weight When Done. If you have any questions about this product by Solutions 34, contact us by completing and submitting the form below. If you are looking for a specif part number, please include it with your message.